If you use PDF Password Cracker Enterprise, you can easily remove password and other security data from PDF. 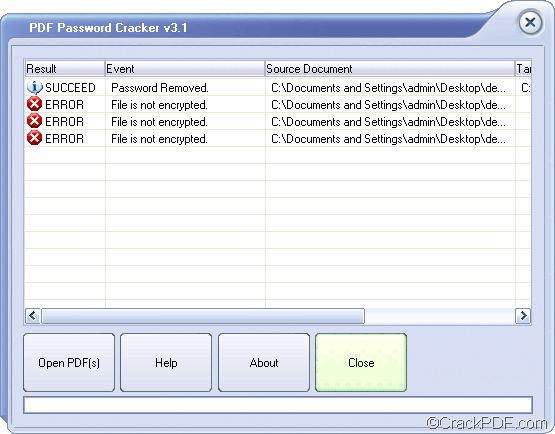 PDF Password Cracker Enterprise is a powerful Windows application. It can not only remove PDF owner password that protects PDF from copying, printing, modifying, etc., but also remove PDF user password which protects PDF from being opened. In addition, it can remove other security data such as metadata, private data, java script actions, form actions, embedded thumbnails, bookmarks, digital signatures, comments, etc. from PDF. In the following contents, you will see how to use this application to remove PDF password and other security data. 1. 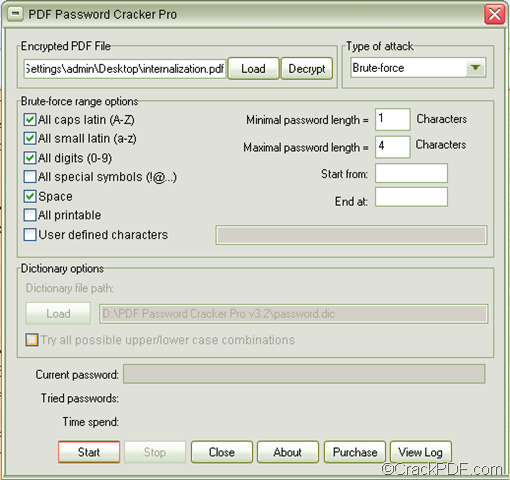 Please free download PDF Password Cracker Enterprise. Then, please install the application on your computer via following the setup wizard. 2. In the opened interface of the application, please firstly add password protected PDF document with drag and drop operations. You can also click the Load button within the “Encrypted PDF File” panel to open file picker window in which you are able to choose PDF document. 3. In the drop-down list of “Type of attack”, please choose a suitable attack method to remove the PDF password. The “Brute-force” method is useful when you can recall something of the PDF password. The “Dictionary” method will remove the PDF password by dictionary. The “Key search” method can be used after you tried the above two methods. If you choose the former two methods, you can set some parameters in the corresponding “Brute-force range options” group box or“Dictionary options” group box. 4. To remove other security data, please click the Options button at bottom of the interface. Then, you can see the “Remove more security options from PDF” window on your screen. Please see it in the following snapshot. 5. Please click the Start button at bottom of the main interface or the Decrypt button beside the “Load” button. Then, the application will remove the PDF passwords and other security data. This is the end of this article and you can click the following button to free download PDF Password Cracker Enterprise. If you want to recover PDF password, PDF Password Cracker Pro will be a good assistant for you. 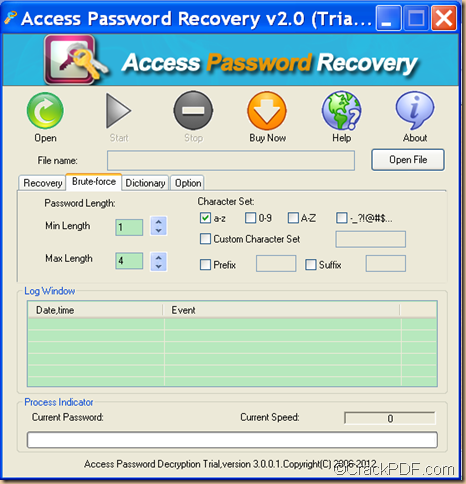 PDF Password Cracker Pro is a professional PDF password recovery application. It can recover PDF owner password that protects PDF from copying, printing, modifying, etc. It can also recover PDF owner password which protects PDF from being opened. 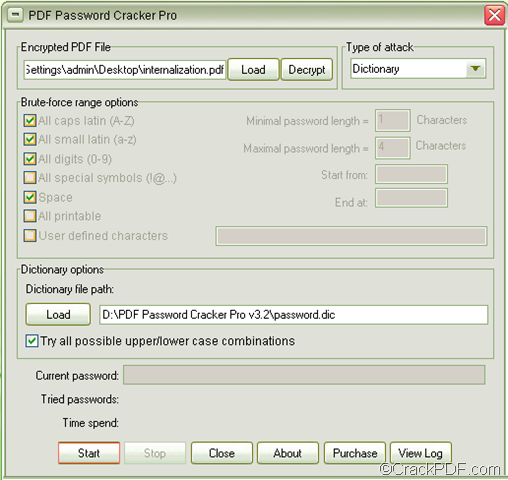 If you don’t know how to use application to recover passwords for PDF documents, please download the free trial version of PDF Password Cracker Pro at first. Then, please follow the steps as shown below. 1. Please double click the downloaded file and follow the setup wizard to install it on your computer. 2. Please open the software and add the encrypted PDF into it by clicking the Load button within the “Encrypted PDF File” panel. Or directly drag and drop the password protected PDF it into the application. 3. Please choose a method to recover the PDF password in the drop-down list of “Type of attack”. There are three options in the list: Brute-force, Dictionary and Key search. If you can recall some part of the PDF password, please choose the “Brute-force” method. If you want to recover the PDF password by dictionary, please choose the “Dictionary” method. If you remember nothing about the password, you can choose the last method – Key search. 4. If you choose “Brute-force”, you can narrow down the PDF password scope in the “Brute-force range options” group box. Please see it in the next snapshot. 5. Please click the Start button at bottom of the interface or click the Decrypt button beside the “Load” button. In the pop-up “Save As” window, please choose an output location in the “Save in:” drop-down list, input a name in the “File name:” edit box and click the Save button in the window. Then, the application will start to recover the PDF passwords. 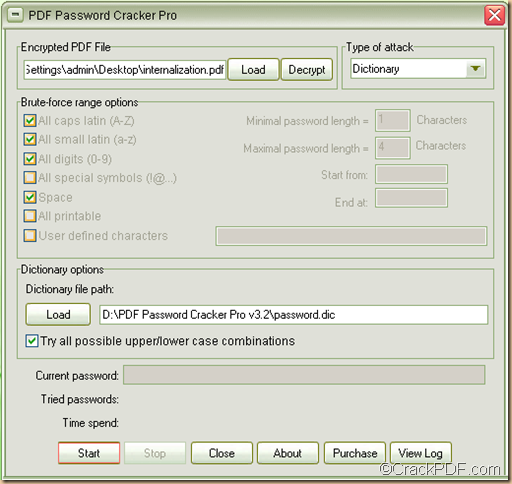 This is the end of this article and you can click the following button to try PDF Password Cracker Pro. This article is mainly about how to remove owner password from encrypted PDF with PDF Password Cracker. Owner password can protect PDF from editing, editing, changing, selecting text and graphics and copying them into the Clipboard, printing, adding/changing annotations and form fields, etc. With the help of PDF Password Cracker, you can easily remove PDF owner password and then you will be able to edit, modify, copy, or print the PDF document. Please download the installer of PDF Password Cracker. Then, please double click the installer and follow the setup wizard to install it on the computer. After you successfully install it on your computer, please double click the icon on the desktop and you will see the user interface on the screen. To add encrypted PDF document into the application, please click the Open PDF(s) button at bottom of the user interface and then choose the password protected PDF in the pop-up file picker window. Or directly drag the file and drop it to the processing table. It supports to remove PDF password in batches, so you can add several PDF files at one time. When finishing adding source files, the “Browse for Folder” window for saving batch files will automatically pop up. Please choose a destination folder, and then click the OK button in the window to start to crack the PDF passwords. Then, the application will instantly remove the PDF owner passwords. You can see the status of the PDF password removal in the “Result” list of the processing table. If it successfully removed the owner password, it should say “SUCCEED”. For documents without owner passwords, it will show “ERROR”. Please see it in the following snapshot. In fact, apart from removing PDF owner password, it can also remove PDF user password. If you are interested in it, please download PDF Password Cracker via the following button. 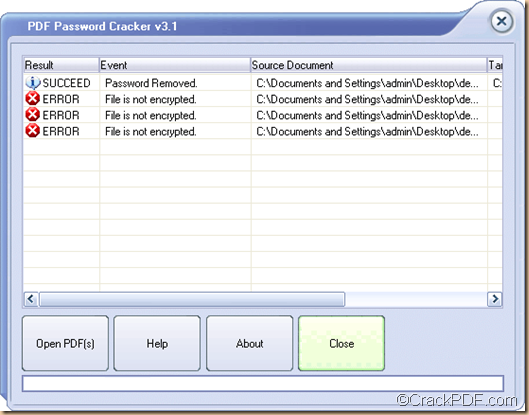 With the help of the application PDF Password Cracker, you can easily crack PDF password. This article aims at showing how to do this kind of work. Please continue to read the contents below. PDF Password Cracker is a professional application that can crack Adobe Acrobat PDF password when you forgot PDF owner password. The so called “owner password” is the password that preventing the file from editing, copying, printing, adding/changing annotations and form fields, etc. It supports 40-bit RC4 decryption, 128-bit RC4 decryption and AES decryption. In the following contents, you will see how to use this application to crack PDF owner password. 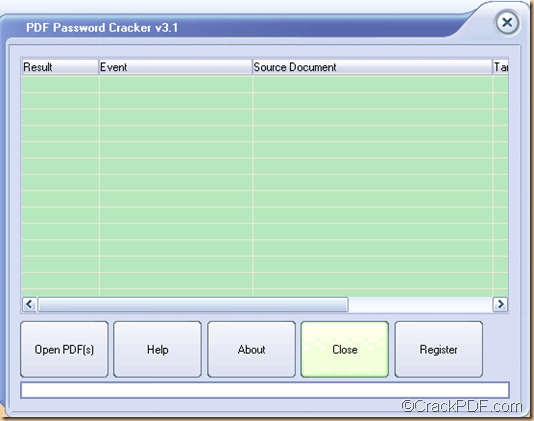 Please free download PDF Password Cracker. After the download, please double click the installer and follow the setup wizard to install it on the computer. After the successful installation, please open the application and then you can see the GUI interface as shown below. Please click the Open PDF(s) button at bottom of the main interface to open file picker window in which you can import the password protected PDF files. You can also use drag-and-drop operation to add the encrypted PDF files into the processing file list of application. When the “Save As” window pops up, you need to choose the output location in the “Save in” spin box and input a file name in the “File name” input box, and then click the Save button in the window to start to crack the PDF passwords. Instantly, it will remove PDF password and display the success information in the file list of application. If you right click on the entry, you are able to view the source PDF document and the target decrypted PDF document. You can also delete selected items or all items from the list window. Note: If you load a PDF document protected by user password, a small window will pop up to ask you to input the user password. With these easy operations, you can quickly crack PDF passwords. Via clicking the following button, you are able to download PDF Password Cracker. Just have a try and you will love it. If you need to remove PDF password protection on Mac OS X, CrackPDF PDF Password Cracker for Mac will help you a lot. There two types of PDF password that protects the PDF file. One is owner password, which is used to protect PDF files from editing, copying and printing. The other is user password, which is used to protect PDF documents from opening or viewing. CrackPDF PDF Password Cracker for Mac is an easy-to-use application that can remove owner and user password protection from encrypted PDF documents on Mac OS X v 10.5, 10.6, 10.7, etc. It is able to deal with dozens of PDF files in one process. 1. Please download CrackPDF PDF Password Cracker for Mac and then install it on the Mac OS computer. After the installation, you will see it in the “Applications” folder in the Mac OS X system. 2. After opening the application, you will see the user interface as shown below. On top of the interface, please click the Add File(s) button in the tool bar to add the password protected PDF files. If you have added some PDF files by mistake, you may click the Remove button beside the “Add File(s)” button to remove the selected PDF files. You can also click the Clear button beside the “Remove” button to remove all the PDF files in the processing file list. 3. At bottom of the interface, please click the Choose button to set an output folder to save the new PDF files without passwords. 4. Please click the Start button beside the “Clear” button in the tool bar. Then, the application will start to remove the PDF passwords one by one. When it meets owner password protected PDF, it will directly remove the owner password protection. When it encounters user password protected PDF, the “Input Password” window will pop up and you need to input the correct user password. By following the instructions above, you can easily remove the PDF owner password and user password. This is the end of this article and you can click the following button to free download CrackPDF PDF Password Cracker for Mac. 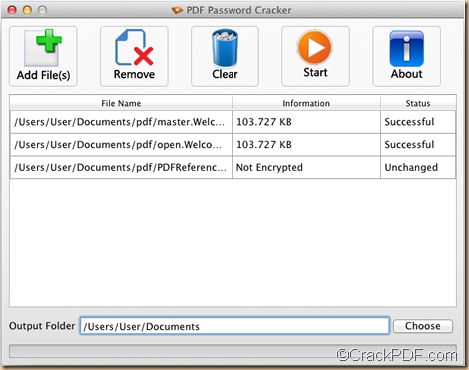 This article is mainly about how to use CrackPDF PDF Password Cracker for Mac. With this smart Mac application, you can easily remove PDF password. PDF supports open and owner password to protect PDF files on two different ways. Open password prohibited unauthorized readers to open it and owner password restrict permissions of printing, copying, editing or commenting the PDF files. 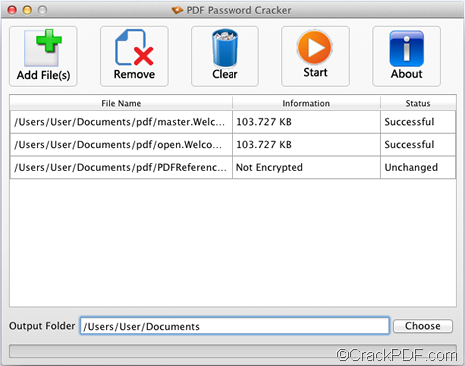 CrackPDF PDF Password Cracker for Mac is a Mac oriented application that can directly remove PDF owner passwords that restrict the editing, copying, and printing permissions. If the PDF file is encrypted with an open password, it also allows Mac users to save the PDF to a new PDF file with inputting the open password. It supports to run in Mac OS X v 10.5, 10.6, 10.7, etc. In the following paragraphs, you will see how to use this application to remove PDF owner passwords and owner password. At first, please free download CrackPDF PDF Password Cracker for Mac and install it on the Mac computer. After successful installation of this software, you will see it in the folder of Applications in the Mac OS X system. Then, please open the application and you will see the main interface of the application. On the interface, please click the Add File(s) button in the tool bar to add the PDF files of which the passwords will be removed. Please see it in the following snapshot. Thirdly, please click the Choose button at bottom of the interface to set an output folder to save the new PDF files without passwords. If the added PDF file is protected by owner password, the application will remove the owner passwords instantly without any requests. However, if the PDF file encrypted by open password, you have to input the correct open password to allow the application to open and save the PDF file. After removing PDF owner passwords and user passwords, you can freely view, edit, copy, etc. the contents of the PDF files. Via clicking the following button, you are able to download CrackPDF PDF Password Cracker for Mac. Just have a try and you will love it. If you forgot your Access password, you may unable to get access to your data in the Access database. Thankfully, now you don’t need to panic as you can retrieve Access password with Access Password Recovery. Generally speaking, there are two types of passwords in Microsoft Access: data password and user password. Data password allows you to get access to your file if you have database-level security set in your MDB files. User password specifies a password for the user account, which allows authorized users to access the account. 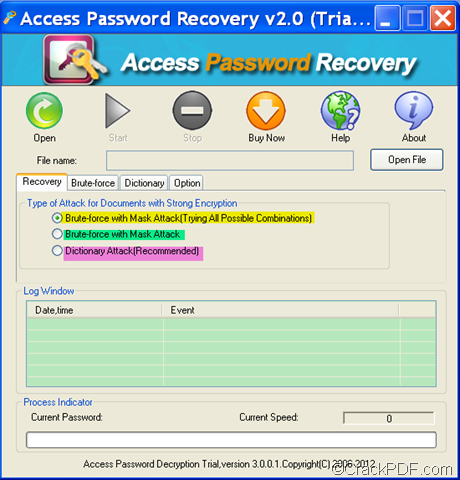 Access Password Recovery is a professional Access password recovery tool that can recover Access data password and user password for all versions of Microsoft Access database. It retrieves Access password in three kinds of attacks: Brute-force with Mask Attack (Trying All Combinations), Brute-force with Mask Attack and Dictionary Attack (Recommended). If you can remember part of the information like the length or character set of the Access password, etc., you can use the second attack method to recover the Access password by following the steps below. 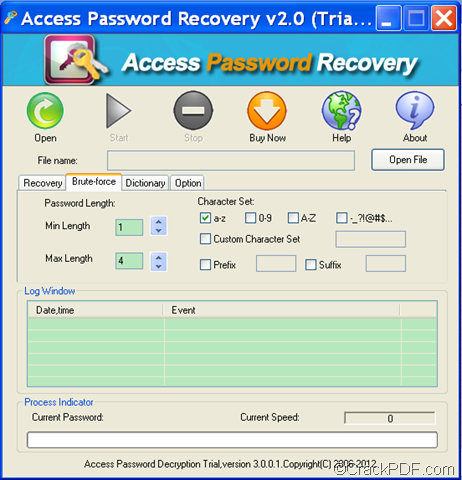 Please free download Access Password Recovery. Then, please double click it and follow the setup wizard to install it on the computer. After the installation, please open its GUI interface on your screen, then click the Open button in the tool bar or the Open File button to add the Access file. In “Character Set” part, you can set the password in pure numbers, lowercase letters, capital letters, etc. You can also customize the character set. In “Prefix” and “Suffix” edit box, you can set prefix and suffix. Step 4. Please click the Start button in the tool bar to retrieve the Access password. As you can see, the whole process is very simple. If you are interested in it, please download Access Password Recovery via the following button. Have you forgotten the password of your Access MDB file? Access Password Recovery offers an effective solution for you to unlock the password protected MDB files in your Access database. A file with the MDB file extension is a Microsoft Access Database file. For safety concern, an organization creates passwords for Access database MDB file to protect them from unauthorized use. Sometimes, if the user fails to remember the passwords of such files, the encrypted MDB files may become inaccessible. In such situation, one can use Access Password Recovery to unlock the MDB files. This smart tool can recover all types of database protection, including passwords to open and user-level workgroup passwords. In the following contents, you will see how to use this application to unlock MDB file that is protected by passwords. Please download the package of Access Password Recovery at first. Then, please follow the setup wizard to install it on the computer. After opening the GUI interface of this application, please click the Open button in the tool bar or the Open File button on the GUI interface to add the secured MDB file in your Access database. After adding the file, please check the radio button of “Dictionary Attack (Recommended)” in the “Recovery” tab. Then, please click Dictionary tab in the middle of the GUI interface to open the corresponding setting panel. Please see it in the next snapshot. On this setting interface, you are able to set mutation count, maximal password length, and dictionary. To set mutation count and maximal password length, you have to check the radio box of “Smart Mutation” on this interface first. Then, you can set them in the “Mutation Count” spin box and “Max Password Length” spin box. To set dictionary, you can reset the default dictionary by clicking the “Select Default” button. You can also check the radio box of “Add Dictionary File”, and then click the “Select Dictionary” button on the interface to add a new dictionary. After the setting, you can click the Start button in the tool bar to start to unlock the password protected MDB file in the Access database. To try Access Password Recovery, please click the following button to download it. This article is mainly about how to recover password for Microsoft Access database document with Access Password Recovery. Microsoft Access, also called Microsoft Office Access, is a database management system from Microsoft, which uses the underlying Jet Database Engine. MS Access stores large number of user’s data like tables, stored procedures, links, hyperlinks and indexes in Access database or MDB files. It is a member of the Microsoft Office suite of applications. 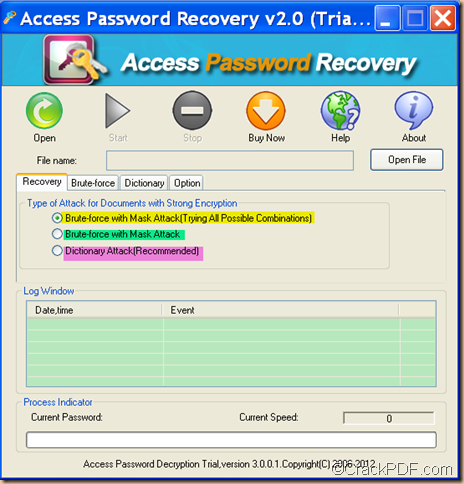 Once you forgot password of MS Office Access documents, the smart application Access Password Recovery offers a good solution for you to recover the password. 1. 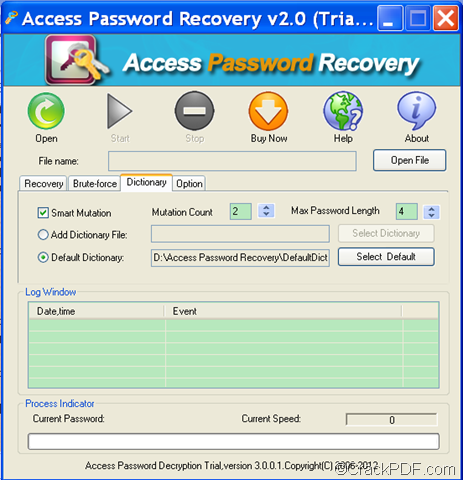 Please free download the installer Access Password Recovery. Then, please double click this installer and follow the setup wizard to install it on the computer. The application will automatically run after you finish the installation. You will see its user interface on the screen. 2. Please add the password protected Access file into the application. There are two ways to add the document. One is to click the Open button in the tool bar of the GUI interface. The other way is to click the Open File button on the GUI interface. 3. Please focus on the tab control in the middle of the GUI interface. There, you can see the three methods as shown in the following snapshot. Please try the recommended “Dictionary Attack (Recommended)” method first, which will try the password combinations in dictionary. If you can recall part of the information such as password length, password character set, etc., you can directly try the “Brute-force with Mask Attack”. If you remember nothing and the dictionary method still can’t recover the Access password, then you can resort to the last method – Brute-force with Mask Attack (Trying All Combinations). 4. Please click the Start button in the tool bar to start to recover the password for the Access file. 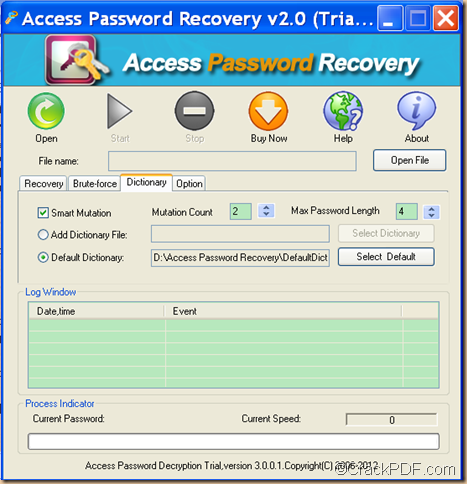 Via clicking the following button, you can download and try Access Password Recovery.